Related: What Is My Furnace’s AFUE and How Can It Save Me Money? Here’s the dilemma: Do you choose the higher upfront cost of a 90%+ AFUE rated furnace? Is it really worth the higher price tag? Need a quote for installing a high efficiency furnace? Just contact us and we’ll send a tech over right away. Yes, 90%+ AFUE rated furnaces have a higher upfront cost than 80% AFUE rated furnaces. But they also provide much lower monthly energy bills because they’re a lot more efficient. And when you track the monthly savings throughout the furnace’s lifetime, you’ll find that your net savings could reach $1,783 (in some cases savings could be even higher!). Determine the difference in cost between a 90%+ and 80% AFUE furnace. On average, a 90%+ AFUE rated furnace costs anywhere from $1,500 to $2,200 more than a 80% AFUE rated furnace. So let’s choose a number somewhere in the middle for this example: $1,850. Calculate the lifetime operating savings of a 90% AFUE furnace. To do this, we used Lennox’s Energy Savings Calculator. Just enter the two AFUE ratings you’d like to compare and the calculator will determine the average savings. Gas furnaces typically live around 15 years. So, we can determine that over the course of the furnace’s lifespan, you would save $3,633 if you chose a 90% AFUE rated furnace over an 80% AFUE rated furnace. Note: Your specific savings will vary depending on the size of your furnace and your area’s gas prices. Subtract the difference in installation cost from the lifetime operating savings to get the net savings. So the overall net savings of choosing a 90% AFUE furnace would be $1,783. That means you pay back the difference in installation cost and get an extra $1,783 back in savings over the lifespan of your furnace. Note: Keep in mind that if you’re moving out of your home relatively soon, you won’t enjoy these savings and the higher upfront price of a 90%+ AFUE furnace may not be worth it. So, yes, as long as you aren’t moving out of your house soon, a higher AFUE rated furnace is worth it from a financial standpoint. Now, let’s look at whether it’s worth it from a comfort standpoint. All high-efficiency furnaces (90%+ AFUE ratings) use sealed combustion. And sealed combustion improves your home’s indoor humidity levels. How? By the way it pulls in air for combustion. Now, the atmospheric combustion process means the furnace draws in air from your home and pushes it outside. That’s bad because for every cubic foot of air that leaves a home, another cubic foot of cold, dry air infiltrates your home. 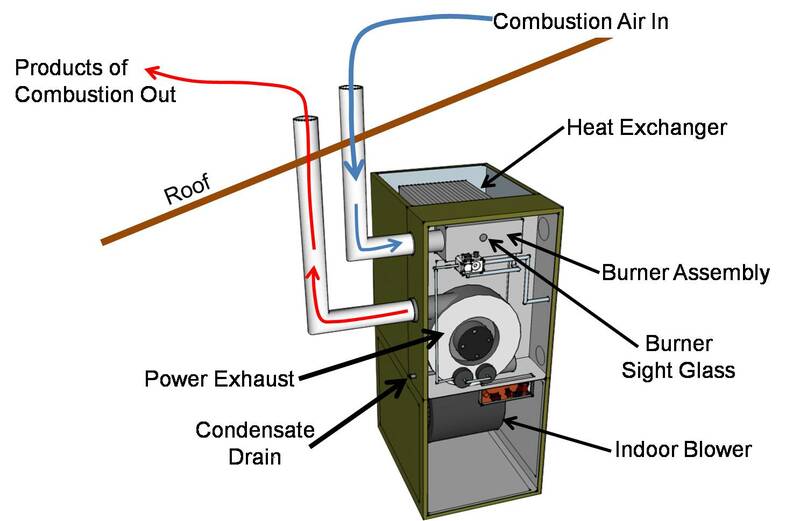 Sealed combustion from a high-efficiency furnace, on the other hand, eliminates these uncomfortable problems altogether by drawing in and heating air from outside your home. How sealed combustion of high-efficiency furnaces works. Variable-speed blowers. These are blowers that automatically vary their speed based on your actual heating needs for more even, consistent heating. Multi-stage burners. These burners adjust their output according to how much heat your home needs instead of operating at 100% output all the time. This allows for more comfortable, precise temperatures. If you’re interested in knowing exactly how much it would cost to install a high-efficiency furnace, we can help. Just contact us and we’ll send out a tech to inspect your home and current heating needs for an accurate estimate.